The Japanese Pattern Challenge: Completing the Jacket Fronts...Tailoring nerds rejoice! Completing the Jacket Fronts...Tailoring nerds rejoice! 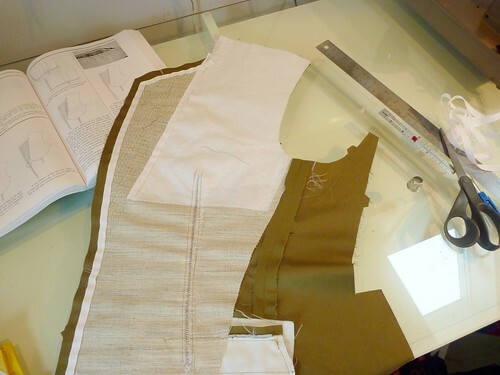 I know that many of you enjoy seeing the tailoring process, so this post's for you! For some, this may look like torture, but I actually enjoy all this hand work. Maybe you do too. It may look complicated, but in reality it's pretty basic stuff. There's a real sense of constructing something as I work through these steps. 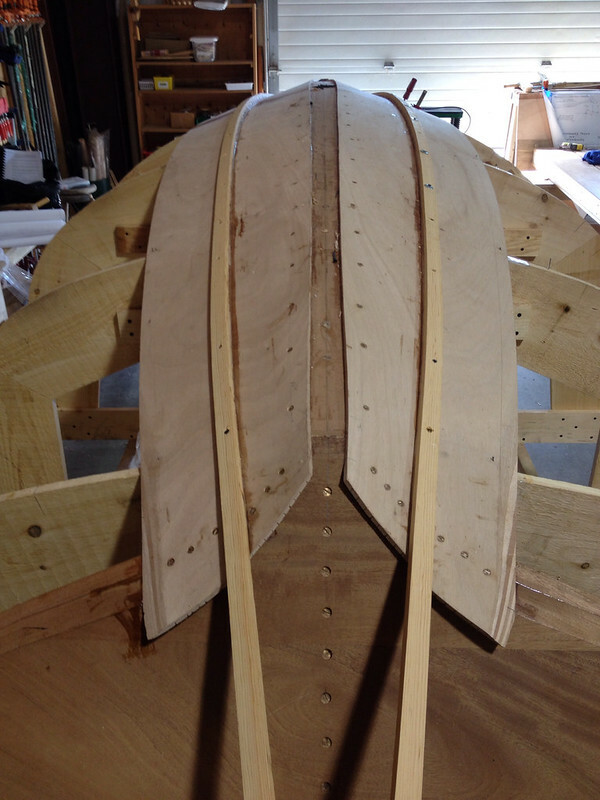 Tailoring a jacket or building a boat, it's all the same in a way. One little step at a time. With the canvas basted to the jacket fronts, I move on to pad stitching the lapels. 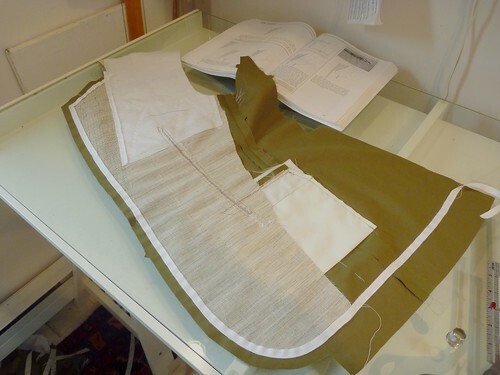 Working parallel to the roll line, small diagonal stitches are worked up and down along the lapel. This job is made infinitely easier with silk thread, and I can't recommend it highly enough. Why? Because it's virtually tangle free in addition to being incredibly strong. I run the thread once through beeswax and stitch away. This is a labor intensive step, so if something as simple as silk thread can make it go easier and faster, I'm all for it. 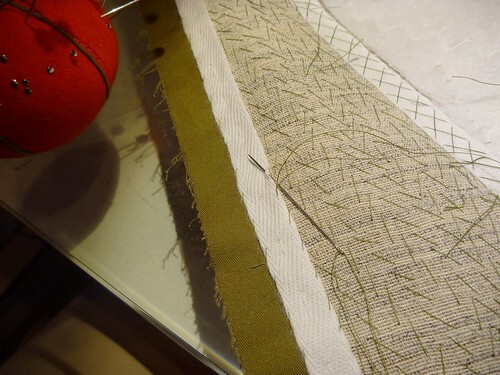 The stitch should be very small, just catching the fashion fabric under the canvas. Roberto Cabrera says it should just be a "pinprick". That would take more skill than I have. My stitches are clearly larger than that. The underside of the lapel will be peppered with tiny stitches, none of which will be visible in the finished jacket, so I'm not going to agonize over the size of my stitches. The next step is kind of hard to describe and harder to photograph. After pad stitching about 1 1/2" from the roll line, the work is turned around and the lapel is folded back into the position that it will ultimately take on the finished jacket. 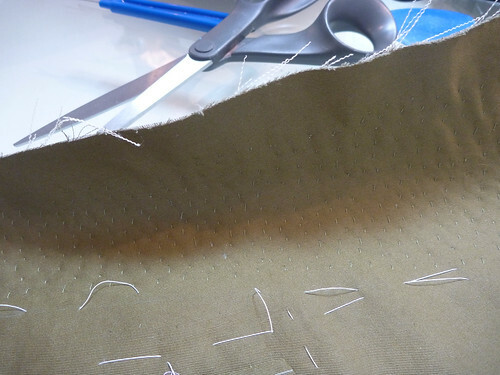 Holding the lapel back, the pad stitching continues in rows until the whole lapel is covered. This step puts a permanent curve on the lapel and will make it want to hug the chest when the jacket's worn. Here you can see all the little stitches on what will be the backside of the lapel. (Bigger than pinpricks I'm afraid!) The shadow hopefully shows how the pad stitching has built a curve into the lapel. Here the lapel is lifting up off my glass top work table. This always amazes me! The next step is taping the edges of the jacket and the roll line. 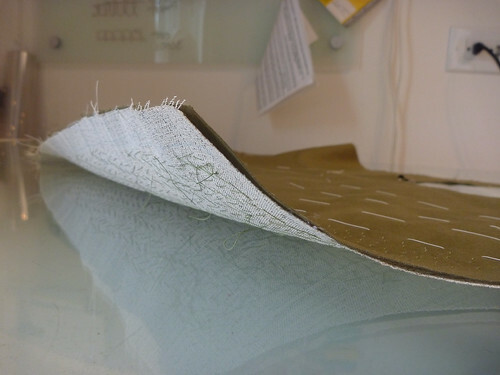 The seam allowance of the canvas is very carefully trimmed off prior to taping. The tape is a 3/8" cotton twill tape that has been soaked in cold water to preshrink it. Starting at the neckline the tape is basted along the lapel edges, down the jacket front and across the hem. Tape is also basted over the top 2/3rd's of the roll line. The tape over the roll line is cross stitched into place. 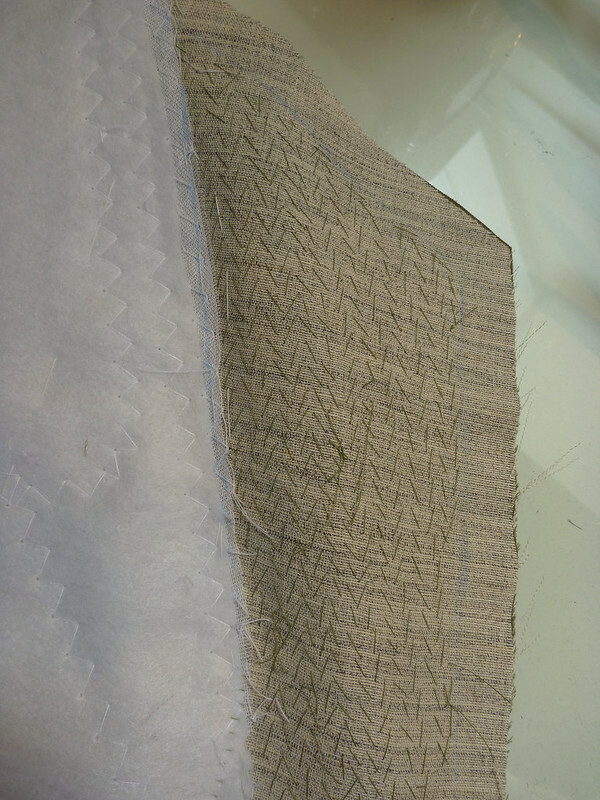 The stitches should be at the outer edges of the tape. Again, silk thread will make this much easier. 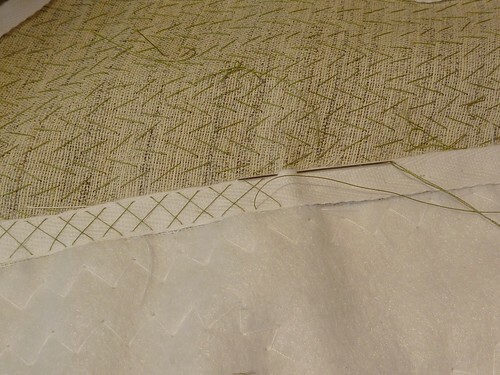 The rest of the tape is slip stitched to the canvas on one side, and to the fashion fabric on the other. This completes the jacket fronts. Next I'll tackle the sleeves. Looking great! Those pinpricks showing on the backs of the lapels will be badges of honor when you show off your hand tailored jacket. Love your pictures and the link to boat building. My husband loves woodworking and has noticed how many recreational woodworkers are married to recreational seamstresses.. I reckon it is because both can justify a high number of gadgets & power tools. Oh, Yeah... I'm supposed to be making a suit.